Ever have something happen that felt totally out of your control? A big one for me was having my studio flood. Several times. Yep, that’s my studio on the top right corner and me in black not accepting the futility of the situation. WTF? Why is this happening?! I feel so helpless. What can I change? How can I fix it right now and make everything all better? Who’s fault is it? Who can I blame? OH, it’s obviously my fault because I’m not good enough and don’t deserve good things. WTF? It’s out of my control?! How can this be? Ok… starting to see that there’s nothing I can do about this. Guess I better make peace with it. Shortly after I bought my property in 2002, it started flooding every few years. The entire place was underwater. I went through all of these stages every time to varying degrees. First I was stunned and couldn’t believe how out of control and helpless I felt. Then I looked around to see what I could fix, starting with the immediate - sandbags, getting my car to higher ground, permanently raising everything off the floor in the studio, and the long-term - adding a French drain and pump, and talking to the city about a bigger infrastructure fix. After doing all I could do I started looking around and wanted to blame everyone from the previous property owner to those around me who started raising their property levels. Then I blamed myself for choosing a bad location, felt sorry for myself and thought about how I could never have good things go my way because clearly I’m just not worthy (Did somebody say victim?!). At some point I had to start accepting that rain and flooding were imminent and totally out of my control. The worst time it happened I threw on my waders, walked to the neighborhood bar and drank wine until the water receded before heading back to start the cleaning process. Other times, I found healthier ways to get to a place of calm and peace (meditation, drawing, writing, etc). Finally, I had to accept that I have no control over repeated record breaking rainfall, lacking drainage, and the resulting floods. How do you tap into feelings of inner peace and acceptance? For me, swimming outside is one way I can almost always get instantly grounded. (Ironic I know.) I feel most alive, inspired, and simultaneously at peace when I’m submerged. Water references and colors always bring me a jolt of joy and inner calm because they take me back to the weightless feeling of being in water. Also ironic, since water is what caused me great pain and loss many times. Blue and aqua colors often find their way into my work to represent a sense of inner calm. Things happen all the time that are totally out of our control. From computer crashes to being burglarized to a loved one getting sick. Each time something happens that feels detrimental, once we reach a place of acceptance (not defeat! ), it’s like a rebirth – getting to a place of inner peace and understanding is the only way through to higher ground. I love the egg shape for this reason - to me it symbolizes a sense of renewal and the feeling of firm ground under our feet with the knowledge that new doors open when others close. Also colors of water, labradorite and apatite are two gemstones that represent feelings of rebirth and calm. Labradorite is used for self-discovery and awakening your life’s purpose. I’ve read it’s a great stone for fighting off existential crisis. Apatite is known to clear away confusion and accept yourself as you are, including gaining greater self confidence. 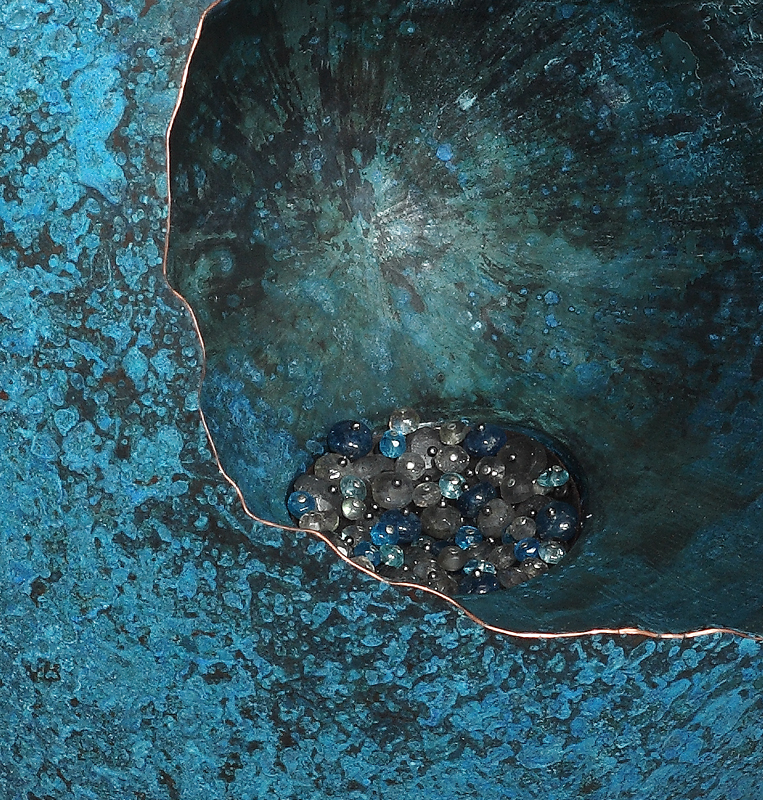 These gemstones form a small pool inside the egg sculpture, a little nucleus of added support in the knowledge that things always work out. I’m fortunate that the city finally did do a major infrastructure fix, adding a huge drainage pipe and (knock on wood) my place hasn’t flooded since. But the process of accepting things that are out of my control will never end. That’s why I think having physical reminders, (like this sculpture) of the knowledge that everything will be ok is essential. 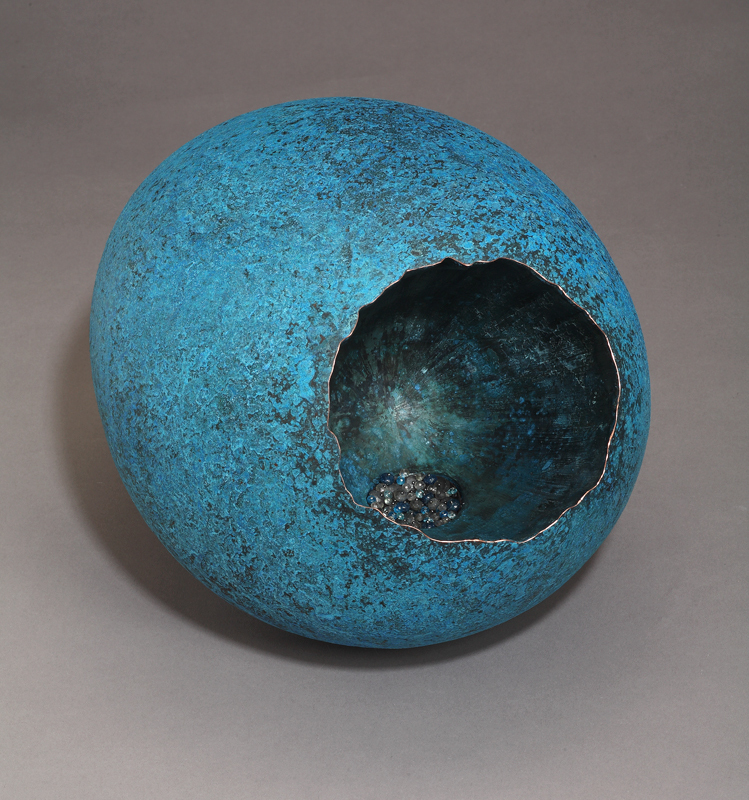 Each time you look at this blue egg sculpture you will be reminded of the process of acceptance, and how letting go leads to inner calm and peace. Because in the end, everything will be ok.
See the Acceptance sculpture here.